Description: The blockade of North Carolina's coast, which included the action of Hatteras Inlet, was a strategic objective in Gen. Winfield Scott's Anaconda Plan. On August 26, an amphibious expedition led by Maj. Gen. Benjamin Butler and Flag-Officer Silas Stringham, embarked from Fort Monroe to capture Hatteras Inlet, an important haven for blockade-runners. On the 28th, while the navy bombarded forts Clark and Hatteras, Union troops came ashore and attacked the rear of the Confederate batteries. On August 29, Col. William F. Martin surrendered the Confederate garrison of 670. The Federals lost only one man. Butler next returned to Fort Monroe, leaving the captured forts garrisoned. This movement was part of Union efforts to seize coastal enclaves from which to enforce the blockade. During World War II, because of the numerous allied ships sunk by German U-boats, the waters off Cape Hatteras became known as Torpedo Alley. Background: The North Carolina Sounds occupy most of the coast from Point Lookout to the Virginia border. With their eastern borders marked by the Outer Banks, they were almost ideally located for raiding Northern maritime commerce. Cape Hatteras, the easternmost point in the Confederacy, is within sight of the Gulf Stream. Ships in the Caribbean trade would reduce the time of their homeward journeys to New York, Philadelphia, or Boston by riding the stream to the north. Raiders, either privateers or state-owned vessels, could lie inside, protected from both the weather and from Yankee blockaders, until an undefended victim appeared. Watchers stationed at the Hatteras lighthouse would then signal a raider, which would dash out and make a capture, often being able to return the same day. To protect the raiders from Federal reprisal, the state of North Carolina, immediately after seceding from the Union, established forts at the inlets, the waterways that allowed entrance to and egress from the sounds. In 1861, only four inlets were deep enough for ocean-going vessels to pass: Beaufort, Ocracoke, Hatteras, and Oregon Inlets. Two forts, Hatteras and Clark, were built on Hatteras Inlet because it was considered the most important. 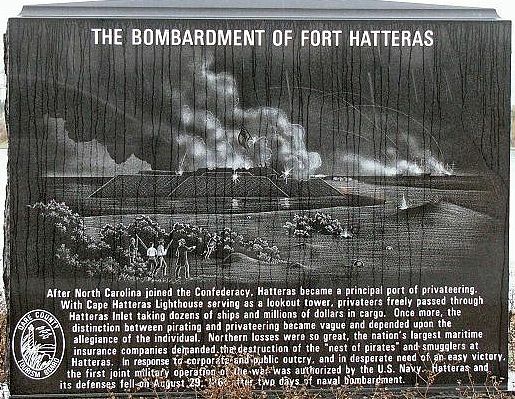 Fort Hatteras was sited adjacent to the inlet, on the sound side of Hatteras Island. Fort Clark was about half a mile to the southeast, closer to the Atlantic Ocean. The forts were improperly armed for coastal defense, however. Fort Hatteras had only ten guns mounted by the end of August, with another five guns in the fort but not mounted. Fort Clark had only five. Furthermore, most of the guns were rather light 32-pounders or smaller, of limited range and inadequate for coastal defense. The personnel problem was even worse. 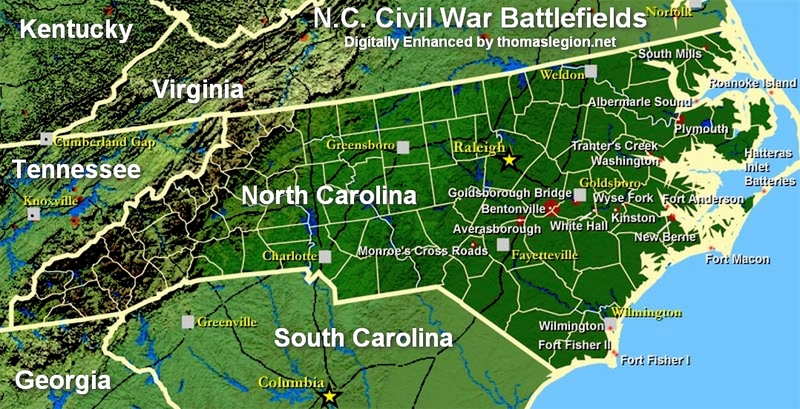 North Carolina had raised and equipped 22 infantry regiments to serve in the war, but 16 of these had been drawn off for the campaigns in Virginia. The six regiments remaining were responsible for the defense of the entire North Carolina coastline. Only a fraction of one regiment, the 7th North Carolina Volunteers, occupied the two forts at Hatteras Inlet. The other forts were likewise undermanned. Fewer than a thousand men garrisoned forts Ocracoke, Hatteras, Clark, and Oregon. Reinforcements, if needed, would have to come from as far away as Beaufort. Strangely, the military authorities in North Carolina did little to keep the poor state of their defenses secret. Several Yankee captains, victims of either capture or shipwreck, were loosely detained at or near Hatteras Island while awaiting return to their homes. They were allowed virtually free access to the forts, and made mental notes of everything. When they returned to the North, at least two of them gave full and valuable descriptions to the Navy Department. Soon after he received the board's report, Secretary Welles began to implement its recommendation. He ordered Commander H. S. Stellwagen to go to the Chesapeake Bay to buy some suitable old hulks. At the same time, he was told to report his activities to Flag Officer Silas H. Stringham, commandant of the Atlantic Blockading Squadron. As such, he was the naval officer in charge of the blockade of the North Carolina coast. This was the first involvement of Stringham with what was to become the attack at Hatteras Inlet. Stringham opposed the plan to block the inlets from the beginning. He believed that the tidal currents would either sweep the impediments away or would rapidly scour new channels. He further believed that the Rebels could not be denied access to the sounds unless the inlets were actually held by the Union. The Federals would have to take the fight to Hatteras. The objective was to silence the guns and capture the forts, and it would require a joint Union Army and Navy command. Gen. Benjamin F. Butler, who was deemed by some as incompetent, was to assemble a force of some 800 men for the expedition. He soon had 880: 500 from the German-speaking 20th New York Volunteers, 220 from the 9th New York Volunteers, 100 from the U.S. Revenue Cutter Service (99th New York Volunteers), and 20 soldiers from the 2nd U.S. Artillery. The men were deployed to vessels Adelaide and George Peabody. When objection was made that the two ships would not be able to survive a Hatteras storm, Stellwagen pointed out that the expedition could proceed only in fair weather anyway because a storm would prevent any amphibious assault. Meanwhile, while Butler was gathering his forces, Flag Officer Stringham was also making preparations. Stringham learned that the War Department had issued orders to Butler's superior, Major General John E. Wool, with the statement, "The expedition originated in the Navy Department, and is under its control." Reasoning that he would be blamed if anything went wrong, he seized the initiative and selected seven warships for the expedition: USS Minnesota, USS Cumberland, USS Susquehanna, USS Wabash, USS Pawnee, USS Monticello, and USRC Harriet Lane. With the exception of USRC Harriet Lane, the ships belonged to the U.S. Navy. He also included in his force the tug Fanny, which was needed to tow some of the surf boats that would be used for the landing. On August 26, 1861, the flotilla, less Susquehanna and Cumberland, departed Hampton Roads and moved down the coast to the vicinity of Cape Hatteras. En route, they were joined by the Cumberland. They swung around the Cape on August 27 and anchored near the inlet, in full view of the defenders there. Colonel William F. Martin of the 7th North Carolina Infantry, commanding forts Hatteras and Clark, knew that his 580 or so men would need help, so he called for reinforcements from forts Ocracoke and Oregon. Unfortunately, communication among the forts was slow, and the first reinforcements did not arrive until late the next day. Battle of Hatteras Inlet Batteries. Courtesy Microsoft TerraServer. 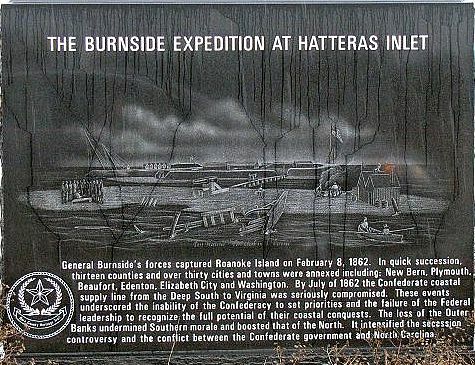 Battle: The Battle of Hatteras Inlet Batteries, part of the Federal Navy's Blockade of the Carolina Coast from August to December 1861, was the initial Union sea and land assault against the North Carolina coast. The Blockade would be followed-up with Burnside's North Carolina Expedition from February to June 1862. The fight at Hatteras was a relatively small but significant engagement in the early days of the Civil War. Two Confederate forts on the North Carolina Outer Banks were subjected to an amphibious assault by Union forces that began on August 28, 1861. The ill-equipped and undermanned forts were forced to endure bombardment by seven Union warships, to which they were unable to reply. Although casualties were light, the defenders chose not to continue the one-sided contest, and on the second day they surrendered. As immediate results of the battle, Confederate interference with Northern maritime commerce was considerably reduced, while the Union blockade of Southern ports was extended. More importantly, the Federals gained entry into the North Carolina sounds. Several North Carolina cities (New Bern, Washington, Elizabeth City, and Edenton among them) were directly threatened. In addition, the sounds were a back door to the Confederate-held parts of Tidewater Virginia, particularly Norfolk. First Day: Early on the morning of August 28, USS Minnesota, USS Wabash, and USS Cumberland began to bombard Fort Clark, while the lighter warships accompanied the transports to a point about three miles to the east, where the troops began disembarking. Stringham kept his ships moving in a loop, with Wabash towing Cumberland. About 11:00 a.m., USS Susquehanna "made her number" and joined in. The ships would deliver their broadsides against the fort, move back out of range to reload, and then come back in to fire again. By remaining in motion, they did not let the artillerymen in the fort correct their aim between shots, and thereby negated much of the traditional advantage of shore-based guns over those on ships. This tactic had been used previously by the British and French at the siege of Sevastopol in the Crimean War, but this was the first time it was used by the US Navy. The return fire from Fort Clark was ineffectual, either falling short or passing overhead, and no hits were made on the bombarding ships. Shortly after noon, the defenders ran low on ammunition, and about 12:25 p.m. they ran out completely. At this point, they abandoned the fort, some fleeing to Fort Hatteras, while others took to boats. Col. Max Weber, commanding the Federal troops already on shore, noted this and moved some men in to take possession, but the fleet was unaware of the movement and continued firing for another five minutes. It was during this interval of confusion that the landing force suffered its only casualty, one of the soldiers being seriously wounded in the hand by a shell fragment. Fortunately, some of the troops were able to contact the gunners on the ships by waving a large American flag, and the bombardment stopped with no further casualties. Stringham and his captains then turned their full attention to Fort Hatteras. Meanwhile, the landings were not going well. Only about a third of the troops were ashore when rising winds produced surf that swamped and overturned the landing boats, and General Butler had to suspend further attempts to land. Colonel Weber found that he had only 318 men with him. The number included 102 from his own regiment, the 20th New York, but also 68 from the 9th New York, 28 from the Revenue Service, 45 artillerymen, 45 marines, and 28 sailors who could man heavy guns. With a couple of field pieces that they had managed to wrestle ashore through the surf, they could reasonably well defend themselves against a Confederate counterattack, but they were too weak to mount an attack on Fort Hatteras. At Fort Hatteras, Stringham kept his ships moving as he had done at Fort Clark. The Confederates tried to conserve their ammunition by firing only sporadically, so Stringham thought that perhaps the fort had been abandoned. (No flag was flying. Before the battle, the old flag had been reduced to tatters, and was never replaced.) He sent Monticello into the inlet to sound it out, but then the fort came again to life. The ship grounded while trying to extricate herself, and in this condition she was struck by five shots. None of these did any permanent damage, although a couple of sailors received minor wounds. As the day came to a close, the fleet withdrew in the face of threatening weather, the exhausted defenders looked for reinforcements, and the Federal troops ashore went to sleep without rations, with water running low, and dreading the reinforcements that their opponents hoped for. After sunset, reinforcements began to arrive at the fort. The gunboat CSS Warren Winslow brought in some of the garrison from Fort Ocracoke, and some of the sailors also stayed to help man the guns. This brought the number of men in the fort up to more than 700, with more expected from New Bern. Accompanying the additional troops was Flag Officer Samuel Barron, commanding the coast defenses of North Carolina and Virginia. Colonel Martin, pleading exhaustion, requested Barron to assume command. He did so, still believing that with the additional troops from New Bern they would be able to retake Fort Clark. Second Day: Dawn of the second day dashed the hopes of the defenders. While the weather moderated enough so that the Union fleet could return and resume its bombardment, it was also able to drive off the transport bringing reinforcements. (One ship was able to reach the fort, but rather than bringing in more troops she carried away some of the wounded.) The fleet initially kept in motion, but they soon found that they were out of range of the guns in the fort. Next, the ships did not alter their positions, but poured their fire into the fort with no danger of reply. There was nothing the men in the forts could do except endure. After about three hours, Barron called a council of the officers, and they decided to seek terms, even though casualties had been quite light. (The actual numbers of dead and wounded remain unknown. Conflicting reports placed the number of dead from four to seven and the wounded from 20 to 45.) Shortly after 11:00 a.m., the white flag was raised. Butler insisted upon surrender, which Barron agreed to. The battle came to a close, and the surrendered Confederates were sent to prisoner-of-war camps. The list of prisoners had 691 names, including those wounded but not evacuated. Aftermath: The battle was significant for several reasons: Following the embarrassment of the Battle of First Bull Run (or First Manassas), July 21, 1861, it was the first notable Union victory of the war. It was also the first application of the naval blockading strategy. As an amphibious operation, it was the first use of joint Union Army and Navy units during the conflict. The Federal ships successfully bombarded the forts while moving and cruising along the coast, making it too difficult for the shore-based batteries to score a direct hit. Butler and Stringham left immediately after the battle, the former to Washington and the latter accompanying the prisoners to New York. Critics argued that each was trying to gather credit for the victory to himself. The pair contended, however, that they were trying to persuade the administration to abandon the original plan to block up Hatteras Inlet. In Federal hands it was no longer useful to the Confederacy, and in fact now allowed Union forces to pursue raiders into the sounds. Although they and their supporters continued to press the case for several weeks, it seems to have been unnecessary. The War and Navy Departments had already decided to retain possession of the inlet, which would be used as the entry point of an amphibious expedition against the North Carolina mainland early the next year. This campaign, known as Burnside's North Carolina Expedition, would completely remove the sounds as sources of commerce-raiding activity. Continued Federal possession of Hatteras Inlet was considerably aided by Confederate authorities, who had decided to abandon Ocracoke and Oregon batteries believing they were indefensible. Stingham's tactic of keeping his ships in motion while bombarding forts was used later by Flag Officer Samuel Francis Du Pont at Port Royal, South Carolina. The effectiveness of the practice led to a reconsideration of the value of forts against naval gunnery. See also North Carolina Coast and the American Civil War. 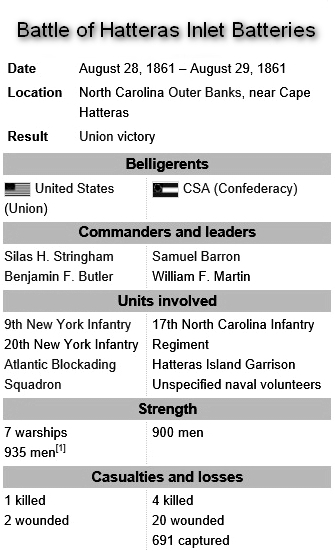 Sources: Official records of the Union and Confederate Navies in the War of the Rebellion. Series I: 27 volumes. Series II: 3 volumes. Washington: Government Printing Office, 1894-1922; The War of the Rebellion: A Compilation of the Official Records of the Union and Confederate Armies. Series I: 53 volumes. Series II: 8 volumes. Series III: 5 volumes. Series IV: 4 volumes. Washington: Government Printing Office, 1886-1901; Maury, Matthew F., The physical geography of the sea. New York: Harper and Brothers, 1855; Simson, Jay W., Naval Strategies of the Civil War: Confederate Innovations and Federal Opportunism. Nashville: Cumberland House Publishing, 2001; Stick, David, The Outer Banks of North Carolina, 1584–1958. Chapel Hill: University of North Carolina Press, 1958; National Park Service.